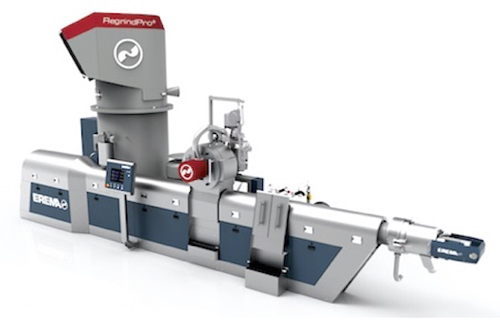 EREMA will be presenting two highlights, RegrindPro, the latest and highly efficient technology for the recycling of regrind material and the opening of the brand new UpCentre, at FAKUMA 2015. To enable recyclates to be used 1:1 as a substitute for virgin material there are two crucial factors, says EREMA. On the one hand, sufficient raw recycling material has to be available and, on the other hand, it has to be possible to process this material economically to make recycled pellets with customised property profiles. Thick-walled regrind has enormous potential in this respect as the input material for recycling – sufficient quantities are available and, above all, they are clean sorted. Reprocessing the recycled pellets from regrind without any problems and ensuring the functional properties of the end products which are made from them, however, requires a specific recycling process – one which conventional systems on the market have so far not been able to accomplish with due thoroughness, explains the company. The new INTAREMA RegrindPro plant system is the solution for this purpose. It is geared exactly to all types of thick-walled regrind material and, thanks to the extremely gentle process and highly efficient filtration, can make application-optimised recycled pellets from regrind. Meanwhile, EREMA is now offering a completely new form of recycling service. With its COREMA product line, the company combines all the benefits of recycling and compounding in a single processing step for the first time. As of 20 November 2015, COREMA technology for the sampling of recycling compounds will be available to customers at the newly installed UpCentre not far from the EREMA headquarters in Ansfelden, Austria.